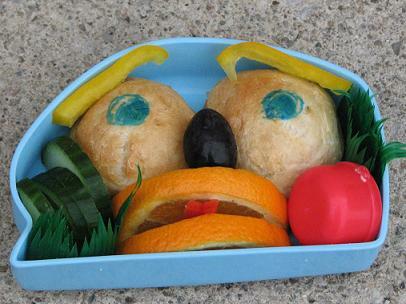 Bento for Kidlet: Funny Face Monster thing? So I was going to try to make a scary monster but I don't think I quite got it. Running low on groceries didn't help! Oh well, it made Kidlet giggle and he ate it all up so that's alright! The "monster" eyes are two homemade rolls with peanut butter and honey, a grape nose, orange lips with bell pepper tongue, yellow bell pepper eyebrows, and some cucumber and dressing in a container on the side. Haha, that's awesome. That definitely qualifies as a funny monster face! m smiling too, the bento looks fun and creative! LOVE it! when i first clicked on your page, i was sitting at a funny angle to my computer screen and the contrast of the roll looked like bloodshot eyes! so for me, it was (as my son would say) "totally freaky".